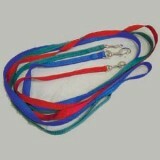 Use this picture to reference approximate colors of nylon available for halters. If you want exact colors we can send the sample kit. Note that from time to time we are backordered on some colors especially teal however we have included all colors in this picture.